In the beautiful countryside 100 kilometers off Rome, vegetables native to Bangladesh, like bitter gourd, okra and pumpkin, are growing. The brains behind the agricultural goldmine scattered over hundreds of acres of land, which meet the needs of the Asian community living across the Europe are not Italian farmers on their iconic scooters but Bangladeshis riding bicycles. After 29 years in Italy, 45-year-old Bangladesh entrepreneur Mohammed Jashim, who now has dual nationality, owns three successful fruit and vegetable shops and makes a monthly profit of 2 million taka ($24,491). Another fruit and vegetable shop owner a few streets away from the Vatican, who has been living in Rome for 12 years, is flourishing and recently acquired the shop next door which he turned into a sandwich bar. But what percentage of the Bangladeshis living in the Mediterranean country can be considered this successful? Those who went to Italy in the past few years are not in a good condition, the Daily Star has learnt. While all legal immigrants have a sponsor, not many, once they reach in Italy, are actually employed by those sponsors. Securing a sponsor through middlemen usually costs an aspirant immigrant over 1 million taka. Iqbal Hossain, a computer graphics designer, went to Italy in late 2007 as a laborer. The Italian coal company didn’t actually need workers but said they had vacancies, says the 28-year-old. Once there, he had to sign a paper saying he was resigning on his own to find another job. It’s another business for the coal factory. We’re also using them to come to Italy. Almost everyone does this, the polytechnic graduate says. Entrepreneurial Bangladeshis have set up a network of middlemen, both in Bangladesh and in Italy, he says. While an Italian expects 300,000 taka to help, Bangladeshi middlemen in Italy would charge 700,000 taka. Apart from spending 100,000 taka for his visa and flight, Hossain gave one of his cousins 1.4 million taka to secure him a work sponsor. Some Bangladeshis like Munir, a salesman at a shoe stall on Via Cola di Rienzo, find Italy to be easygoing, chaotic, and a lot of fiddling of taxes and VAT. But to many others, it’s not so easygoing. A Bangladeshi stall keeper on the same street, who has been living in Rome for four years, is planning to go to U.K. after three years. He huddles with 12 other Bangladeshis in a three-bedroom apartment, each of them spending around 30,000 taka for rent, food and living expenses. They get picked up in a van in the morning and dropped off here, work all day, and get taken back later. Second most popular European destination for Bangladeshi workers, Italy is home to around 100,000 legal Bangladeshi workers. According to official Italian estimates, the number of illegal immigrants in the region is between 20,000 and 50,000. In the first six months of 2012, 4,700 working visas, 1,800 family union visas and 241 student visas (it was 164 in 2011) were issued. Talking on this popularity, Italian Ambassador to Bangladesh Giorgio Guglielmino says Italy’s guaranteed minimum wage of 75,000 taka, compared to the 8,000-12,000 taka some other countries offer a month, is pretty good. Hossain also agrees and says he has been able to save around 120,000 taka a month over the past four years. Not everyone can earn this amount of money. And it can be devastating for those who can’t manage a permanent job. 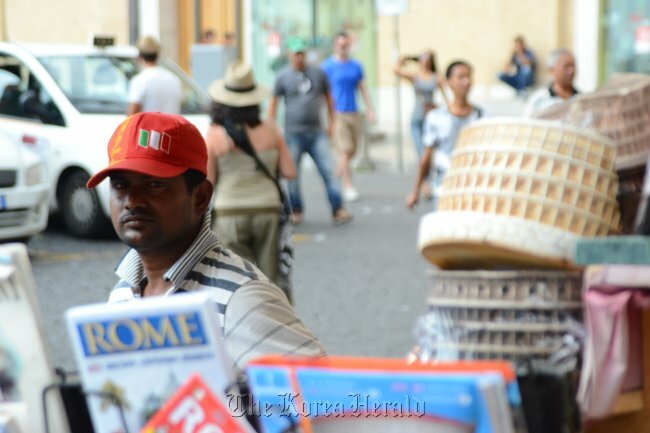 On a summer day, Bangladeshi immigrants can been at every tourist site, be it the Vatican, the Colosseum or Fontana di Trevi, trying to sell sun umbrellas, fans, water bottles and guides to hot and sticky tourists. During the night, many of these men would swap the goods for a bunch of roses to sell to slightly less sticky people sitting in restaurants and piazzas. Most of these Bangladeshis have recently arrived with poor Italian or are illegal and therefore cannot get better jobs. Some can manage a job for five months of the year and it’s a real struggle for the rest of the year. Amena Hossain, a Bangladeshi working for a Rome-based NGO, says she met a Bangladeshi college graduate in the midst of snow and slush selling roses to pedestrians one evening earlier this year. He got a sponsor to come to Rome, but now couldn’t get a job ― all he wanted was a job that would get him off the streets.